Black wins the "ultimate backgammon"
White has 15 checkers on the bar. The gentleman playing the black pieces is in the process of backgammoning his opponent with fifteen men on the bar. When Black removes his final checker, he will have achieved The Ultimate Backgammon. A fantasy, to say the least, but not an impossibility. 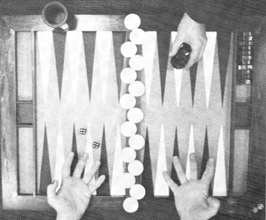 Determine, from the opening set-up, the fewest number of legal moves necessary for Black to backgammon White in the Ultimate fashion (fifteen checkers on the bar). You must count all of your selected throws and moves for both players. The opening throw may not be doubles. The entry with the fewest legal throws and plays that is acceptably recorded wins. Ties will be resolved in favor of the entry utilizing the fewest throws of doubles. Further ties will be broken by random drawing. A roll for White of 4-2 is recorded W (4-2). A move from the six-point to the five-point is written 6/5. 6/5* indicates that a man was hit on the five point. 19/20(2) denotes that two checkers were moved. Bar/23 indicates that a man from the bar was entered on the twenty-three point. –0– denotes that no play is possible. Remember to record the throw that resulted in "no play." 4/off indicates that a checker on the four point was borne off. Any other method of game recording is acceptable so long as it is complete and presented in an understandable manner. All entries must be received by October 12, 1981 and become the sole property of the Backgammon Magazine. What's the answer? Who won?